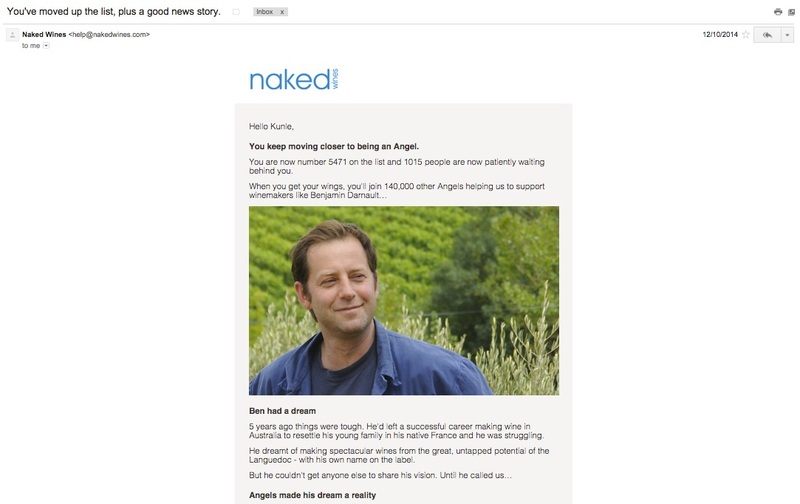 Naked Wines is a truly innovative brand and one that I, both as a customer and as a marketer, greatly admire. From a customer’s perspective, they relentlessly infuse dynamism into their business and are a genuinely friendly voice in the overly sniffy wine retail segment. Putting on my marketing hat, their website’s user experience (UX) proves extremely strong in the area of persuasive psychology; their copywriting — on-site and within customer communications — is crisply written, with an easily identifiable tone of voice to go along with it. They also consistently employ a surprise and delight factor, ranging from their numerous stories about the winemakers they support to the free bottle of ‘premium’ wine that they offer with monthly case purchases. 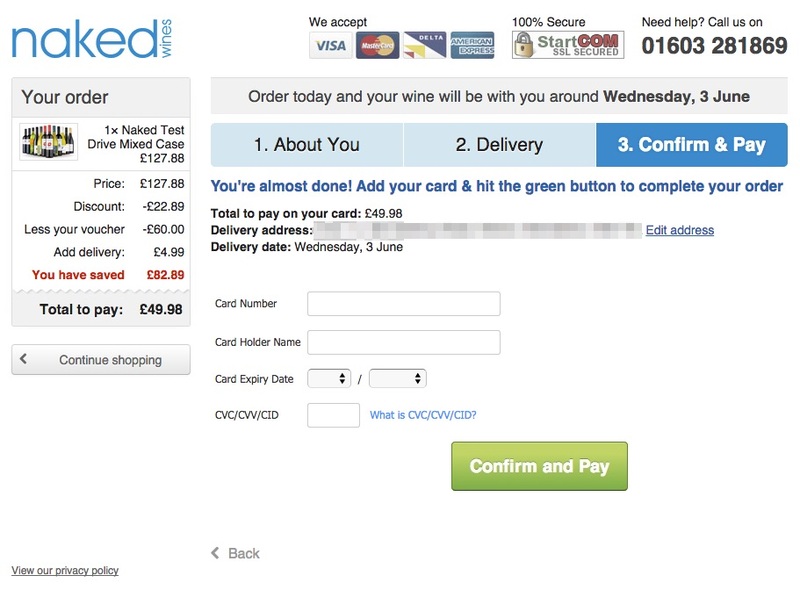 Not just another commoditized eCommerce operation in the usual ‘here are our products – buy them from us’ format, Naked Wines infuses a strong sense of community, blending stories from winemakers (whom members fund, can follow, provide feedback to and exchange messages with) with products that can be purchased. 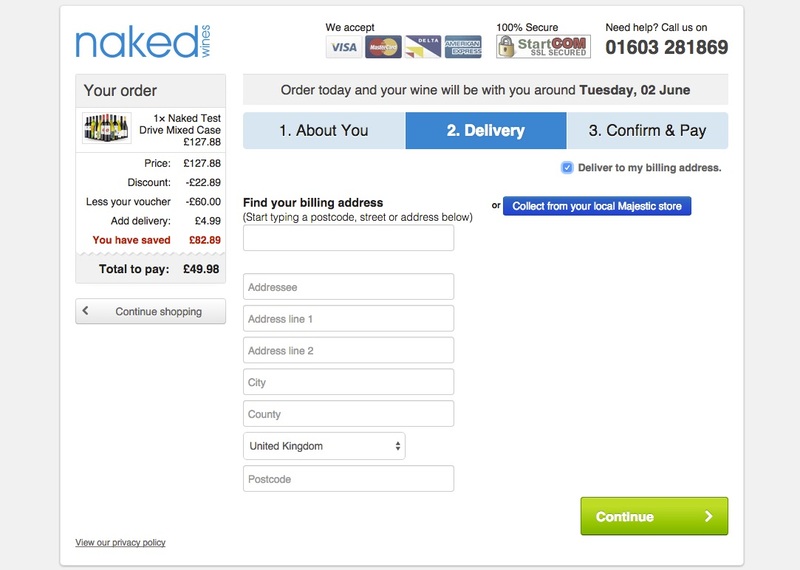 It is a tall effort for entrepreneurs and marketers to build and deliver a truly social experience into a retail environment, but Naked Wines seem to have nailed it. 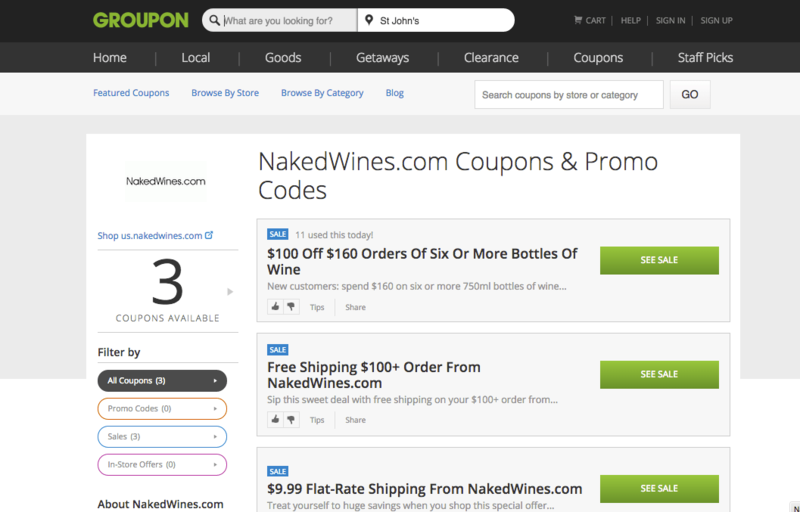 What Does a Naked Wines Customer Look Like? How Do They Acquire Customers? 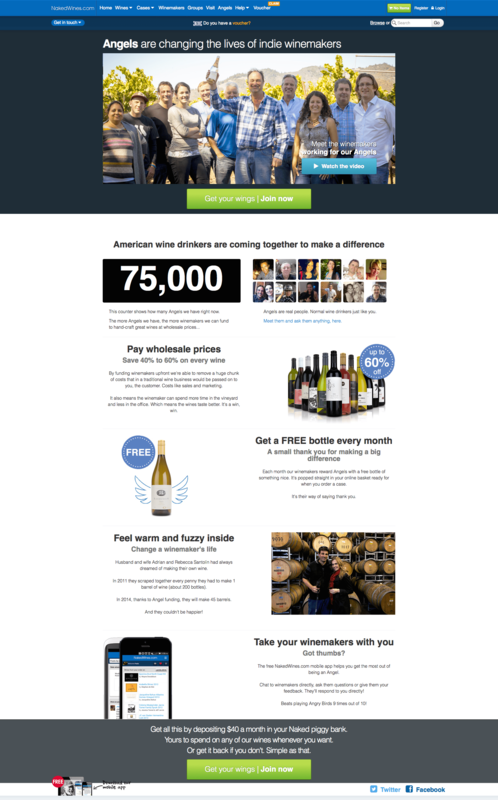 I joined their site in October 2014 and according to a Gmail search, have received a total of 52 emails from Naked Wines since I signed up. That is an average of 6 emails per month, or 1.5 emails a week, which I have been absolutely happy to receive — because they are not all necessarily about a selling proposition. 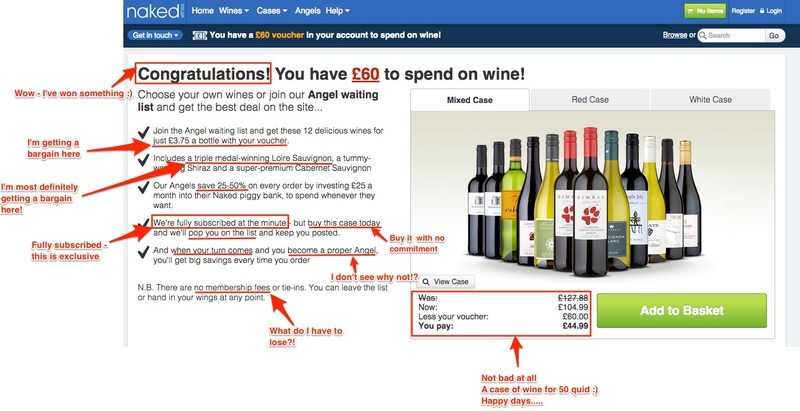 This post is geared toward unraveling how Naked Wines got me into their loop, their customer acquisition strategy and to break down their persuasive psychology techniques. Naked Wines is the Kickstarter for vineyards. 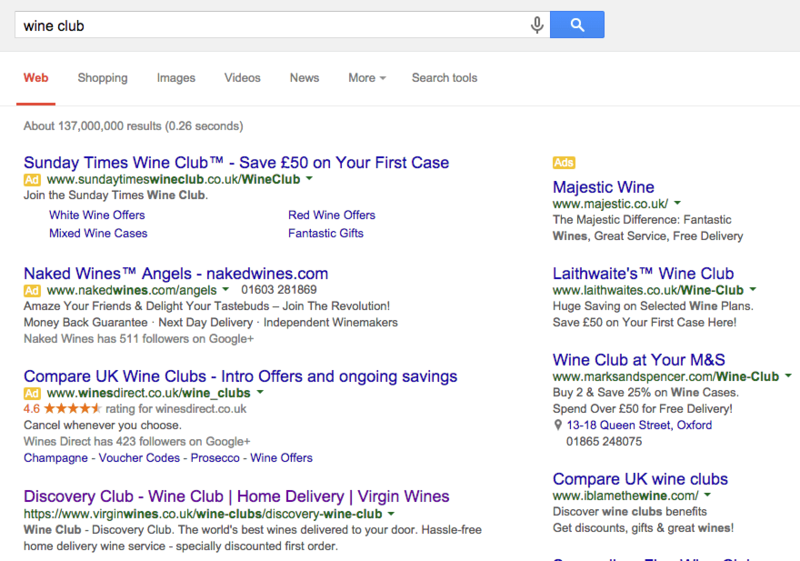 They were also recently acquired by high street multi-channel retailers Majestic Wines for £70 million in April 2015. 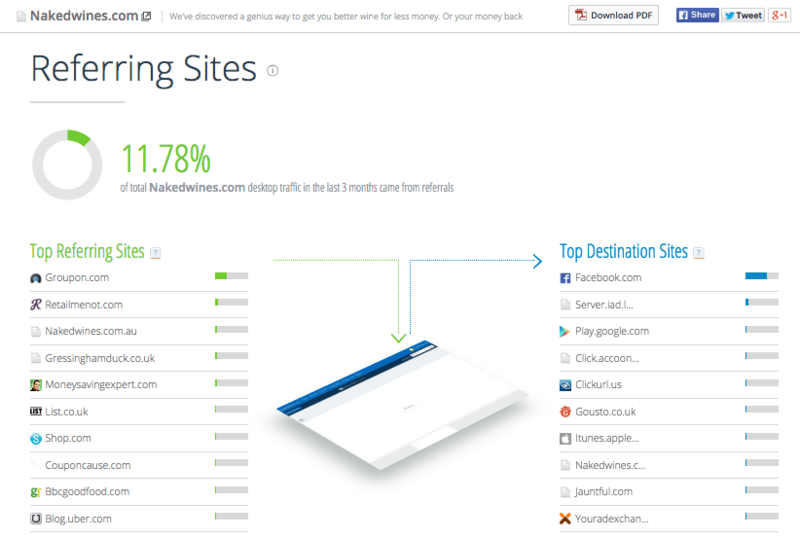 Staggering… but not surprising; direct traffic accounts for 67% of desktop traffic, followed by search and link referrals. With 300,000 members (repeat customers), I can safely deduce that a significant segment of direct traffic will come from repeat visitors. 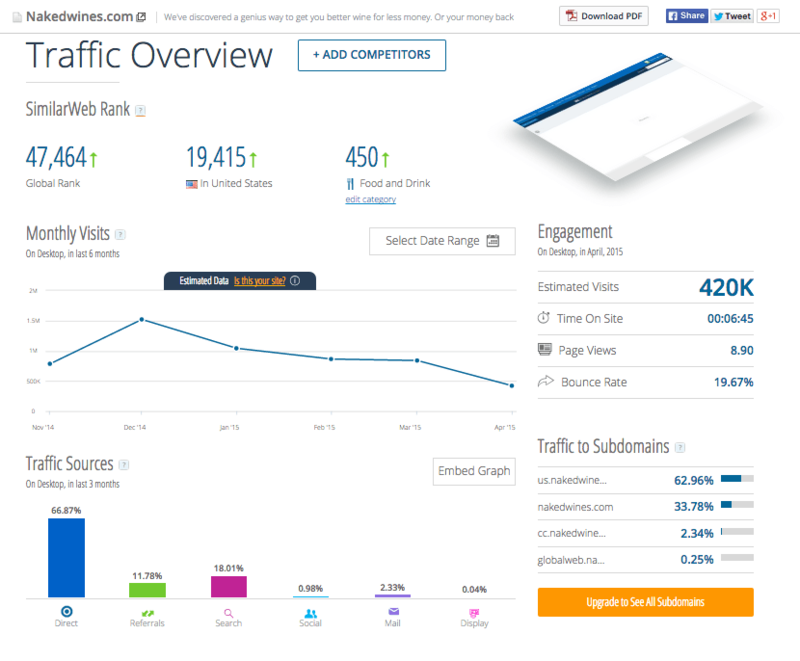 SimilarWeb’s traffic estimates (which are typically not too far off from actuals) for desktop and tablet traffic counts visits at 420,000 for the month of April. Brand awareness is, however, quite strong — with well over 50,000 brand related searches a month in the UK alone (these figures are UK only). 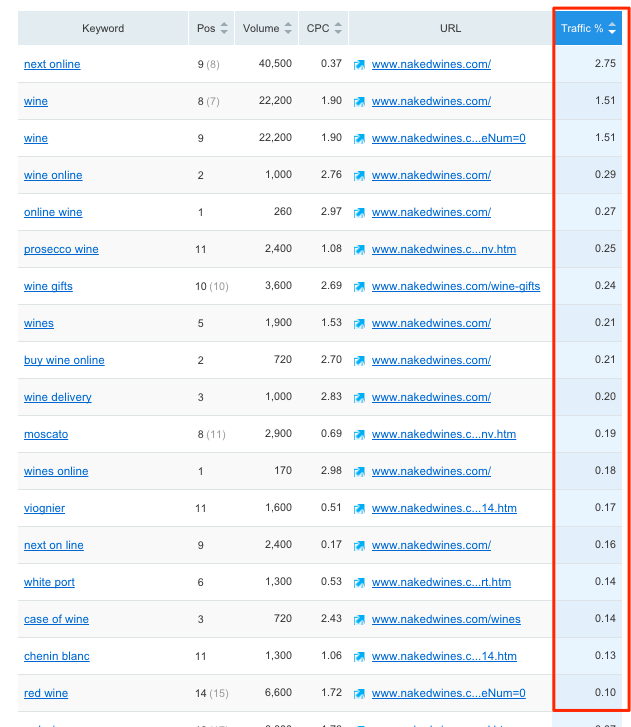 The US is also quite similar, at over 50,000 brand name searches. 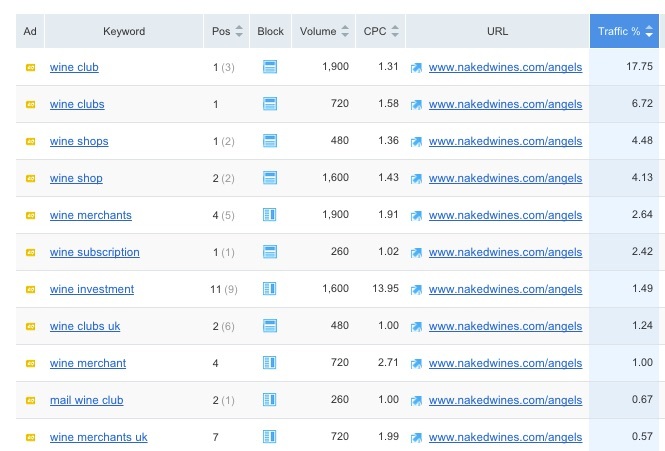 For a pure-play online retailer, this volume of brand name search is impressive. 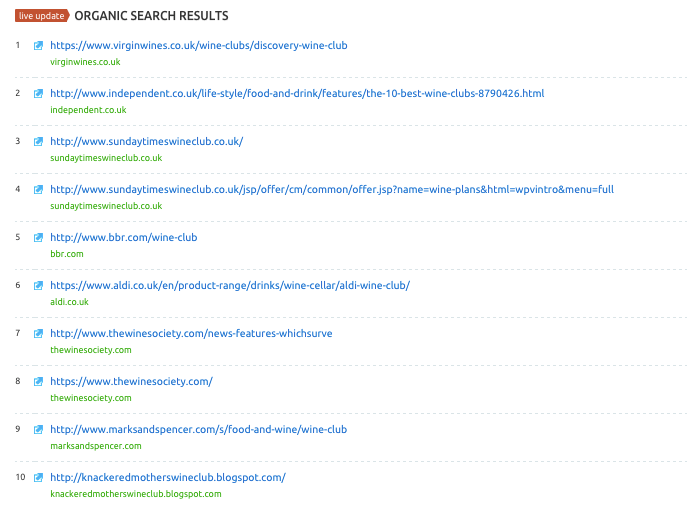 One other point worth noting with regards to their SEO is that, given Naked Wines is a wine club, you’d expect a page 1 presence for the term ‘wine club’ or ‘wine clubs’; they are actually not on the top 100 organic SERPs for both terms, but do have an AdWords presence. 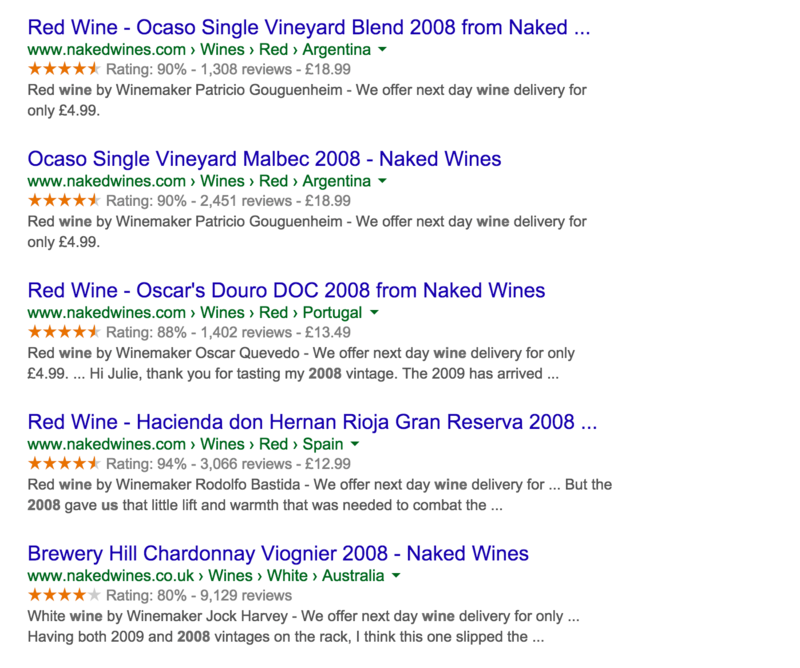 Naked Wines’ product pages are driven by the wisdom of the crowds — they have ensured that social proof is thoroughly infused into each product page template. Notice how the product description and the ‘action box’ (or Call To Action box) take up only a thin slice of the vertical space? 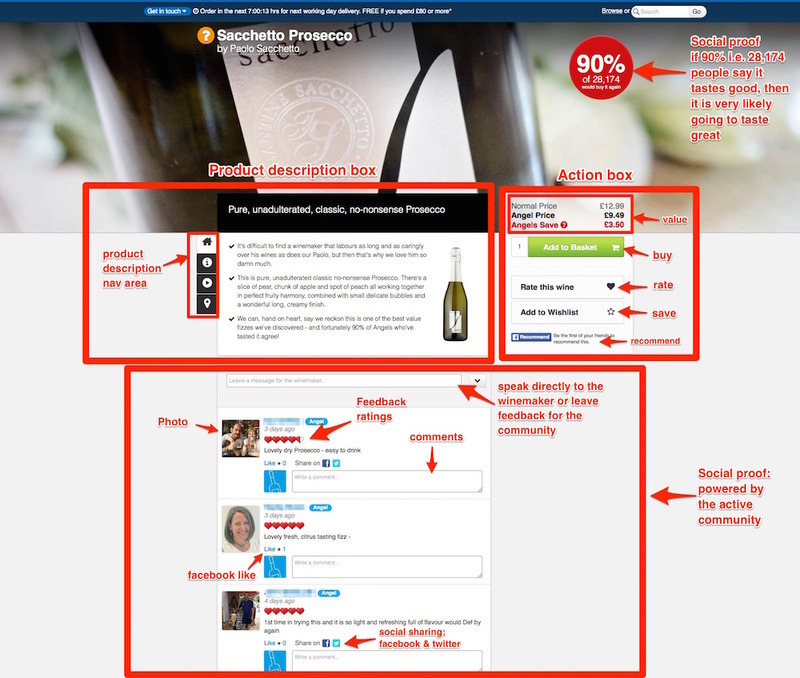 The rest of each product page is dedicated to driving conversations through reviews, ratings and comments to both winemakers and other members of the community. 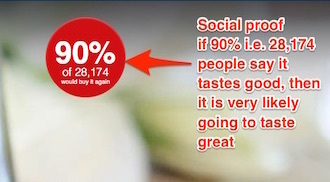 The summary circle with the percentage point at the top right corner is more or less a scorecard for the product in view, which aids and nudges people to quickly form an opinion or purchase decision. 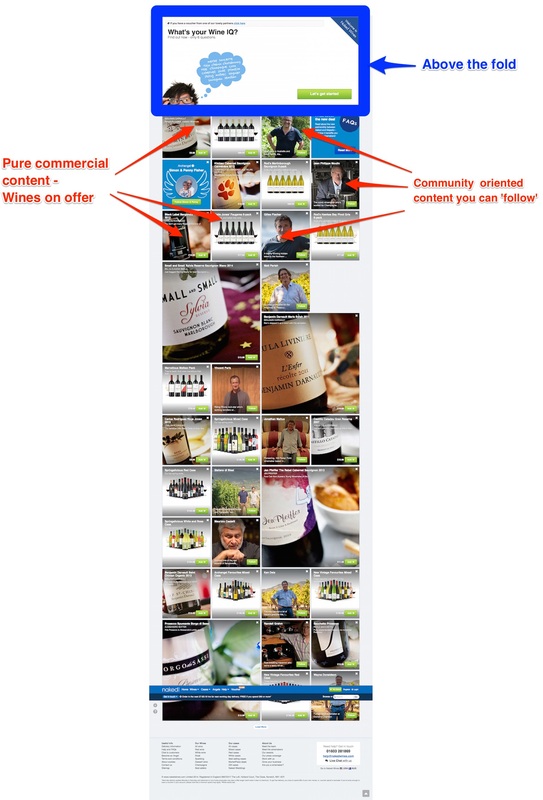 Naked Wines have quite an active and well built-out community with adequate user/member hierarchy. Users of their community are broadly split between ‘Angels’ (members) and ‘Winemakers’. But their community does also have support staff that are labeled ‘Naked Staff’. Members could be ‘Angels’, ‘Archangels’ and ‘New Angels’. Members are able follow other members and winemakers. 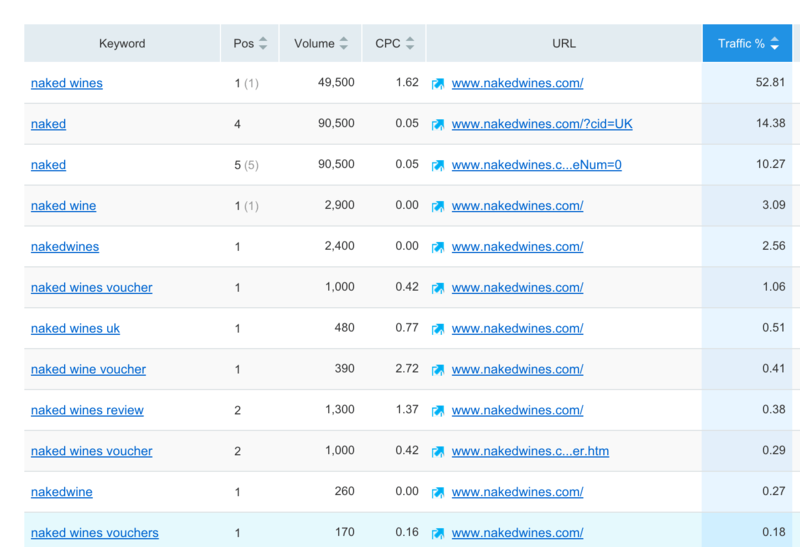 Taking a look at their AdWords campaign from SEMRush data, you would find that Naked Wines tried AdWords for about 2 years until 2012, stopped and then started again in April 2015. You’ll notice that they are limited by search volume. Word of mouth — recommendations over a glass of wine. 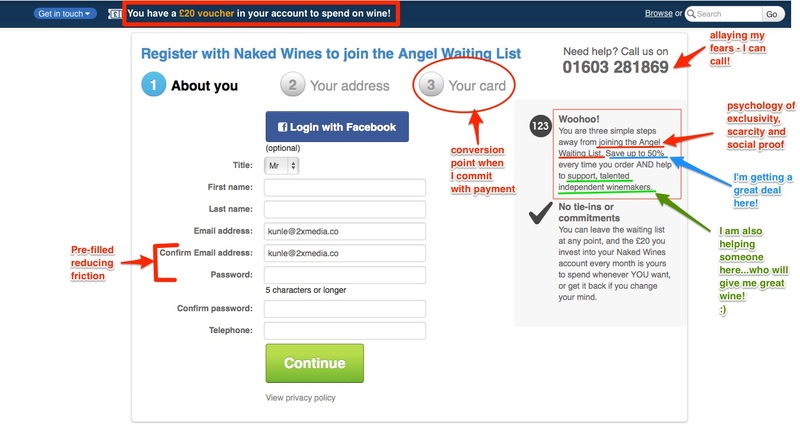 I was scheduled to interview a Naked Wines exec on the 2X eCommerce podcast show and was carrying out pre-interview research — it is worth noting that I had come across Naked Wines’ vouchers a number of times both offline and online in the past. 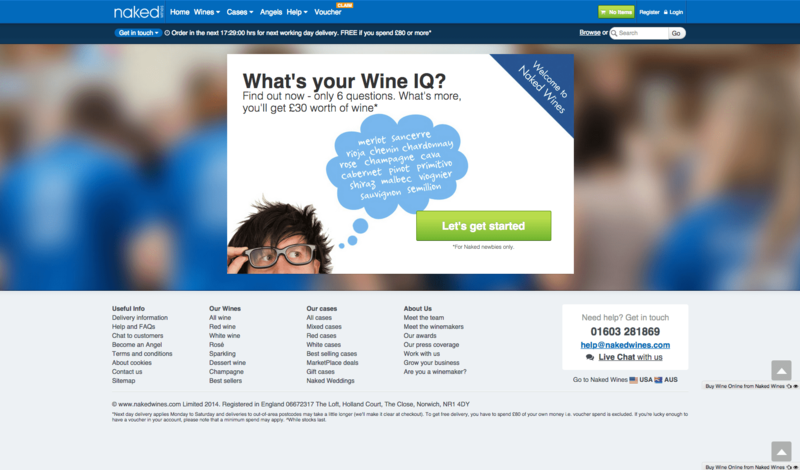 I took their home page ‘Wine IQ Test’ feature (as it looked interesting). And from the image below, you can easily see the play of the psychology of exclusivity and urgency: ‘not for everyone’ – takes only ’43 seconds’. 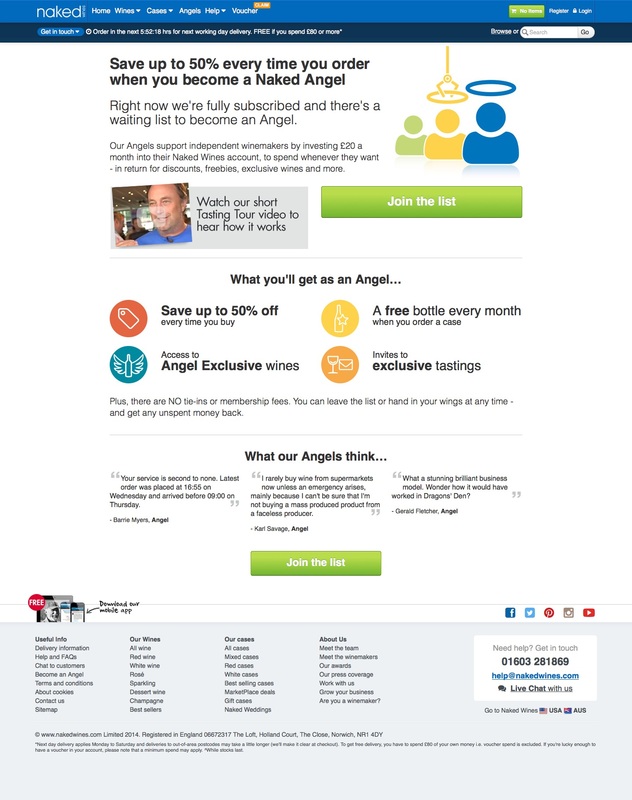 Their lead magnet is ‘the £20 voucher’ – notice how it stands out on the header area. As you would imagine, being #5,471 in line with 1,015 people behind me immediately triggered a psychological sense of scarcity (the same feeling you get waiting in a line on Black Friday), but also social proof (the herd mentality, driven by the fact that thousands of people also want this product). 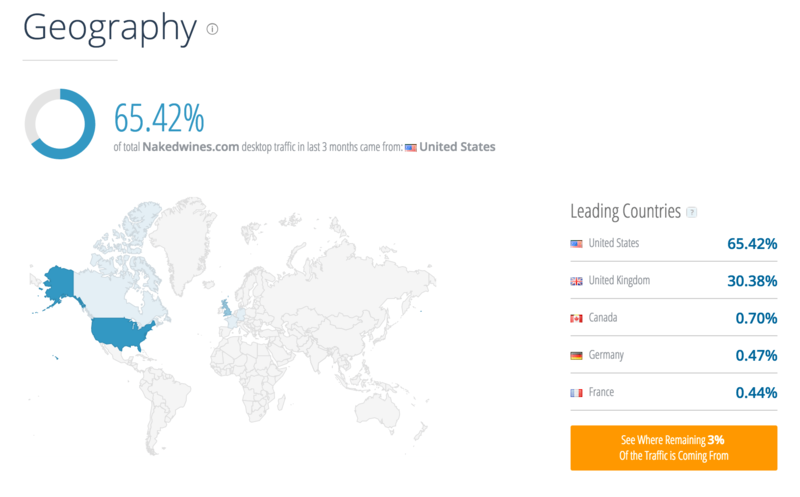 10 Days after signing up…. I was now roughly 1,000 places forward at #4,223 and will be joining 140,000 other Angels… yippie! I am now #3,991 in line, with 5,345 behind me… and I’m thinking wow, whatever these guys are selling is as attractive as hot cakes! 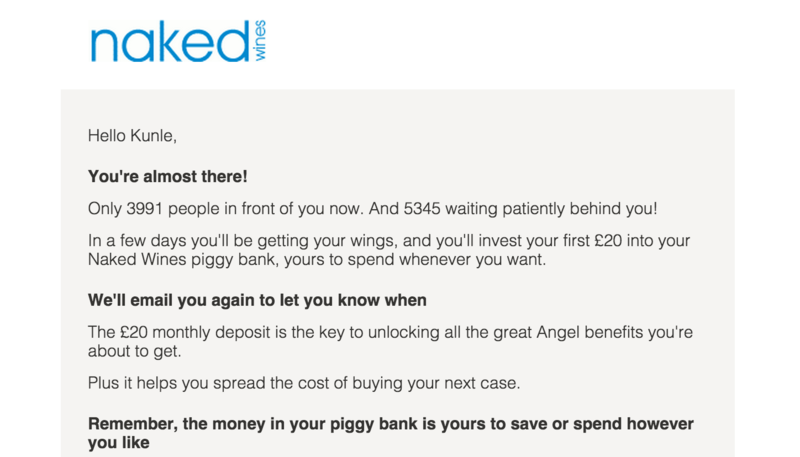 They also gave me a reminding nudge to expect to make a £20 monthly deposit in order to ‘unlock great Angel benefits’. 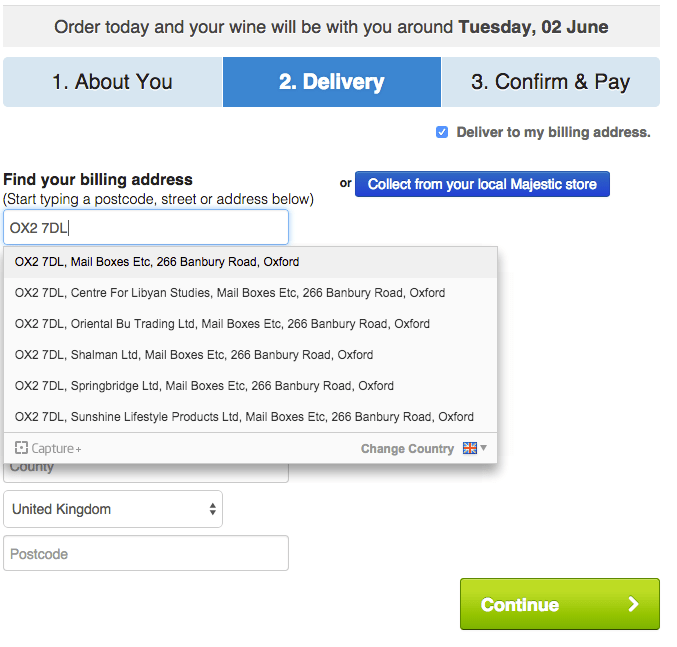 With 6 emails received and a 4 week wait under my belt, my first £20 deposit was made, unlocking access to (in their words): exclusive wines, 25% – 50% discounts, free monthly samples when a case is ordered, group access and ‘priority’ phone access. Despite being discounters, they still hammer home the psychology of exclusivity to potential members via their queuing system. People looking to drive a hard bargain, yet maintain quality assurance. Their communications consistently emphasize value and savings, right from the first £20 voucher through to the fact that members get 25% – 50% off retail prices. It is an incentive driven value proposition. This encourages first-time visitors to take their ‘Wine IQ Test’. 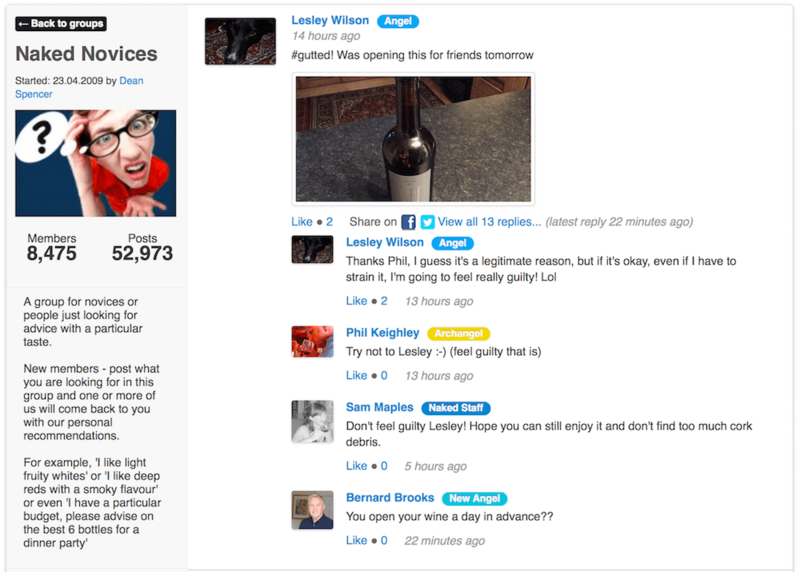 I also love the play with gamification – the ‘Wine IQ test’. Which is a fine blend of community and commerce (mentioned earlier in this article). Members are able to follow winemakers as well as view featured bottles or cases of wine. 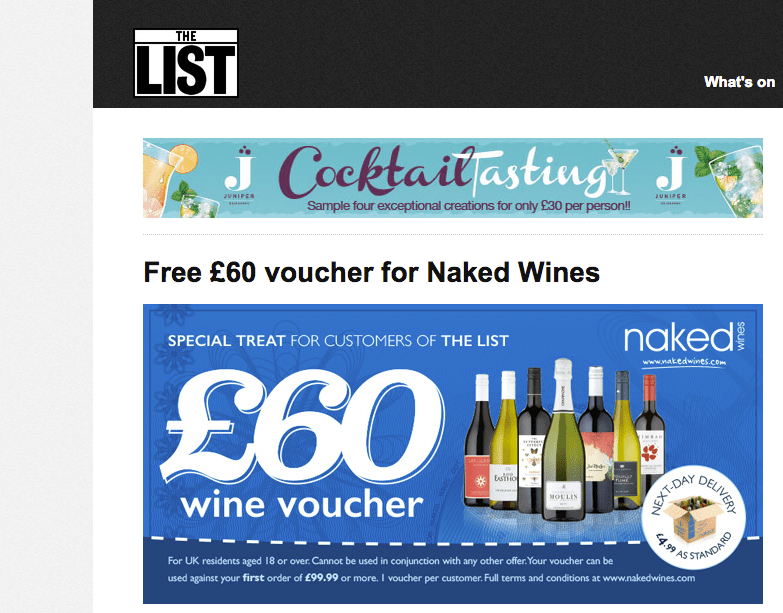 One final point worth making is that Naked Wines have not followed the ‘business blogging’ club and deliberately do not refer to their news updates page as neither a blog nor a news page. Instead, they prefer to refer to their news updates section (for logged in users only) as simply ‘Coming Soon’. This demonstrates a forward-looking approach; all of the content on there is forward dated with no archive of older or previous posts. Updates appear to expire permanently. 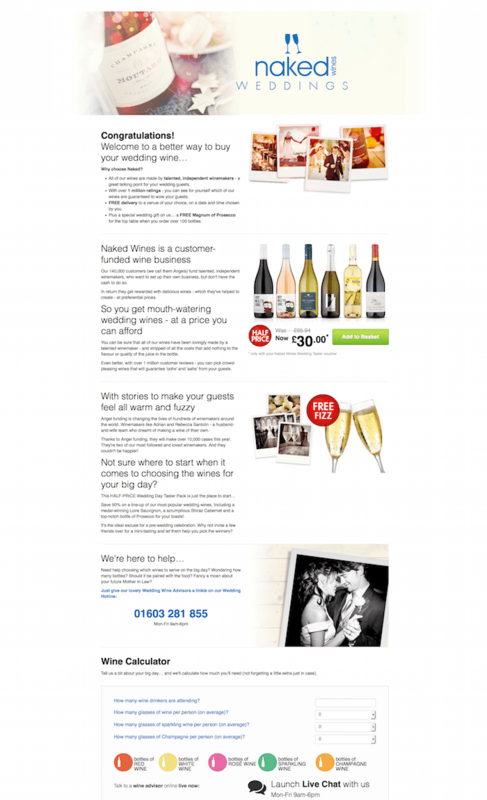 Naked Wines have a segment of their business dedicated to retailing wine in higher volume to weddings. It is a lead generation business. 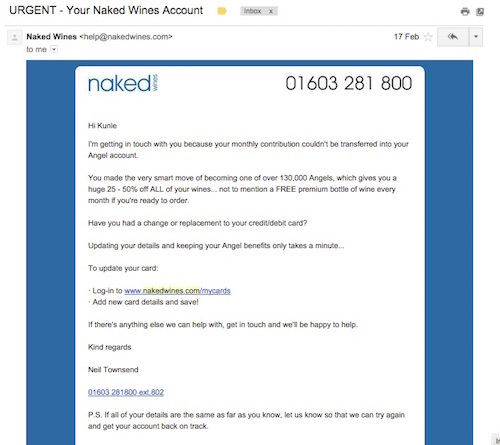 Naked Wines is very much run like a Software as a Service (SaaS) business — they have a customer retention manager. 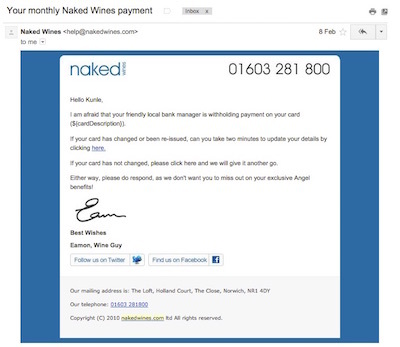 Back in February, I misplaced the credit card I had on file for my Naked Wines account… and because I didn’t update my account with new details, my monthly payment failed. 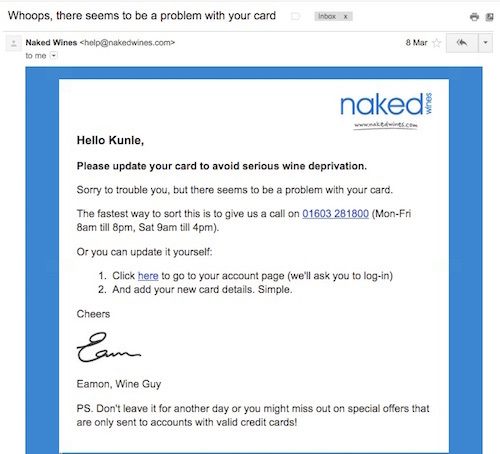 And then, a full month on, I got this email nudging me to update my card to avoid serious wine deprivation! I also had a few phone calls from their Wine Advisors prompting me to tackle the payment issue. My response to them was that I intended to update my card details at ‘some point’. 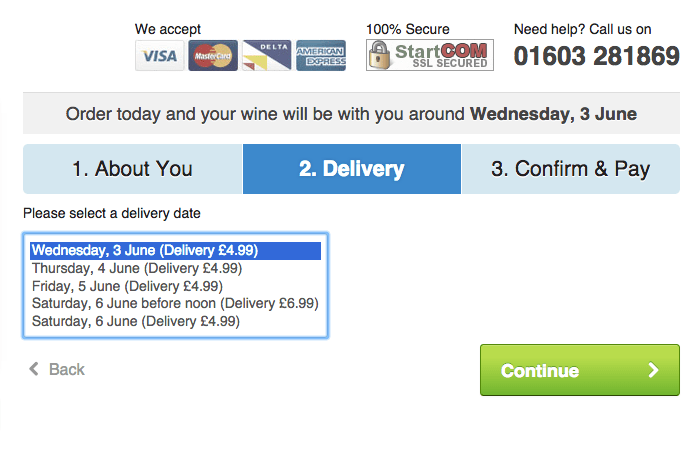 In order to get any of their ‘free’ bottles of wine, you have to commit to making an order — in the example below, the free bottle of Pinot Noir worth £15.99 could only be bagged if you purchased 11 other bottles of wine before 15th June. Putting your marketing hat back on, it is immediately apparent that the June 15th deadline is an urgency heuristic plugged into their storytelling AIDA model. 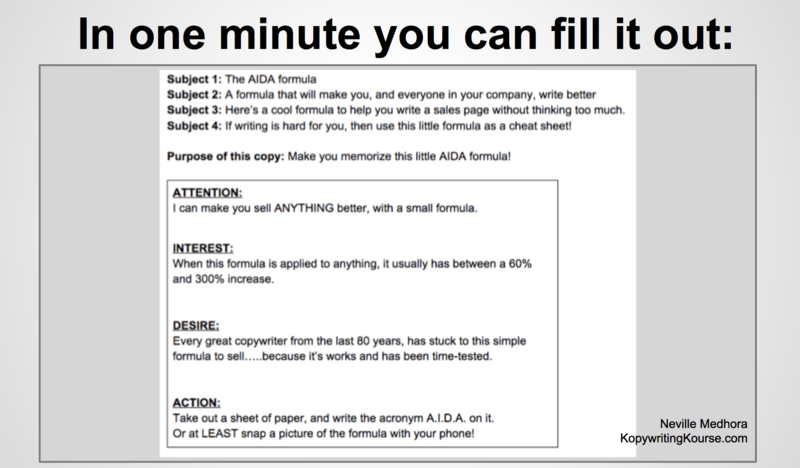 It is used to fuel the urge to not only buy the bottle, but to buy an entire case of wine (if you are not familiar with the storytelling AIDA model, I implore you to go through this slidedeck (ppt) on Copywriting by Noah Kagan and Neville Medhora). 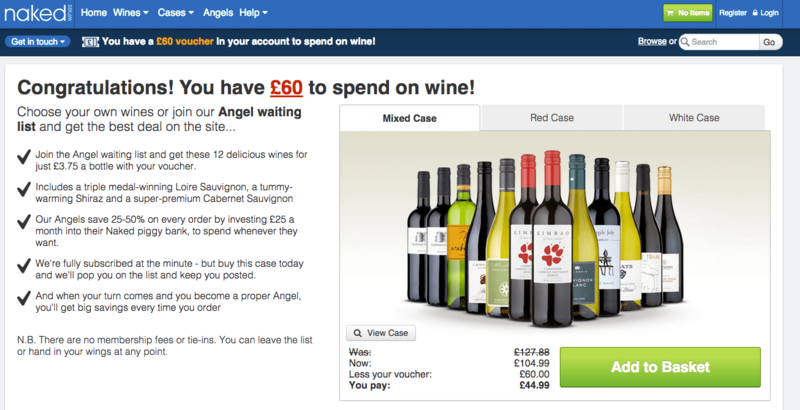 This is another example of a gentle nudge — urging me to spend £100 I have accrued in my Naked Wines account to purchase 11 bottles of wine in order to get this free ‘Angel Sample’. 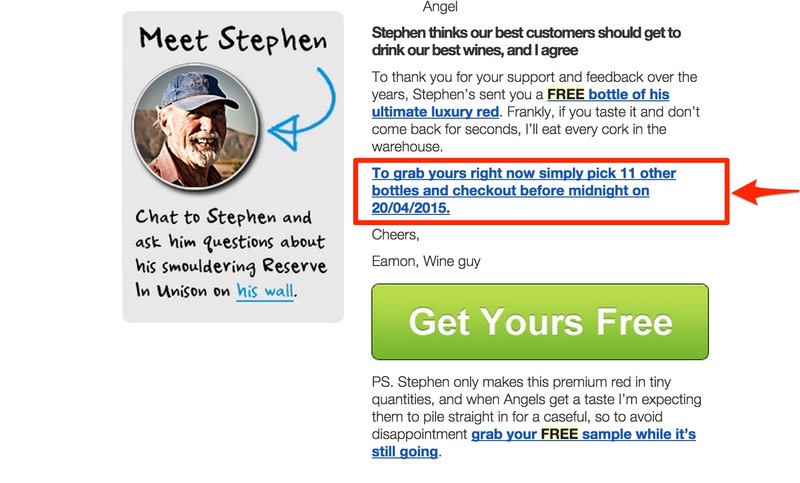 Again, notice how personal it is, from a guy named ‘Eamon’ — the ‘Naked Wine Guy’. The tone of voice is very friendly and conversational… he asked me to grab my freebie before it turned into a pumpkin! 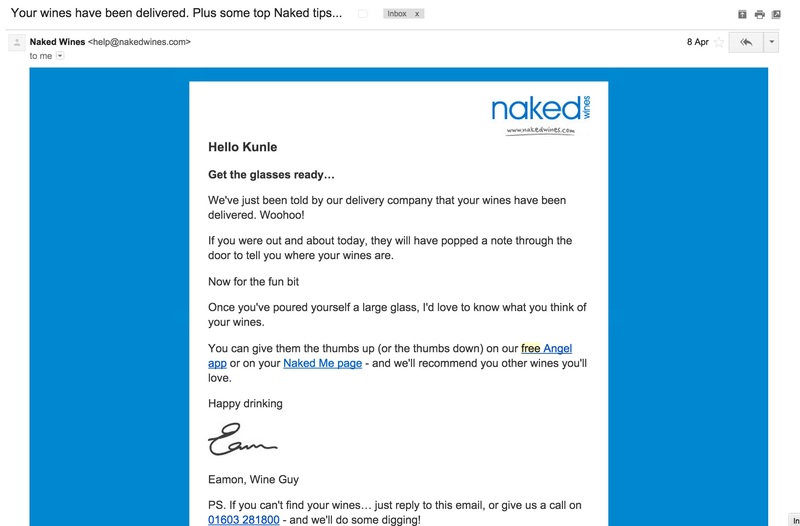 This is another email from ‘Eamon’ the Wine Guy — asking me to get glasses ready… because their delivery company has told him my case of wine has been delivered. 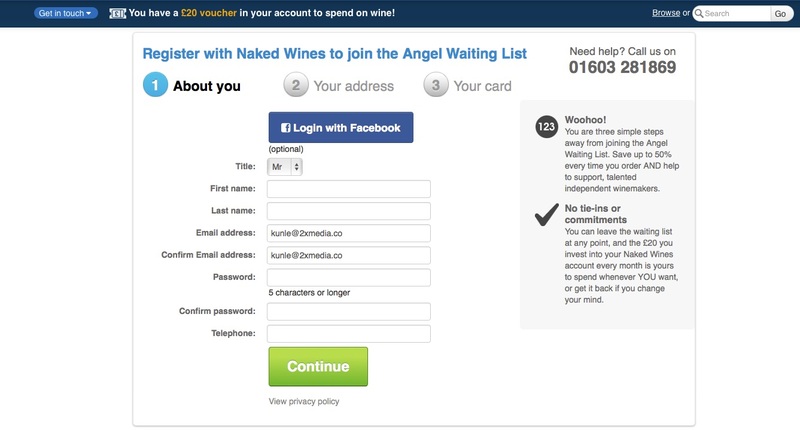 Given that customer retention is the nucleus of Naked Wines’ operations, their mobile app plays quite an important role in driving engagement. 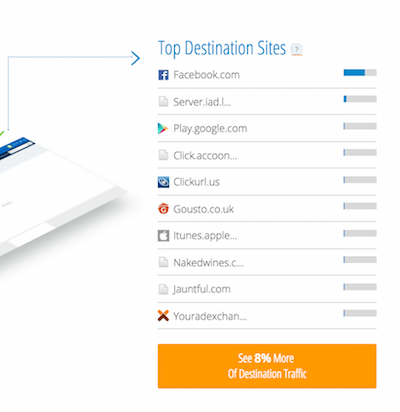 Their footer persistently links (from a banner) to their mobile app download page. 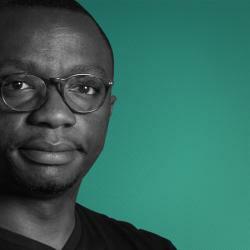 Although I have not tried out their app, it is a worthy takeaway for similar eCommerce businesses with retention in the form of monthly subscriptions built into their business model to consider mobile apps as an additional means by which to provide access and drive engagement with their customers or members. I am inclined to think that the Naked Wines tasting tours are not only revenue drivers but might also be profitable. 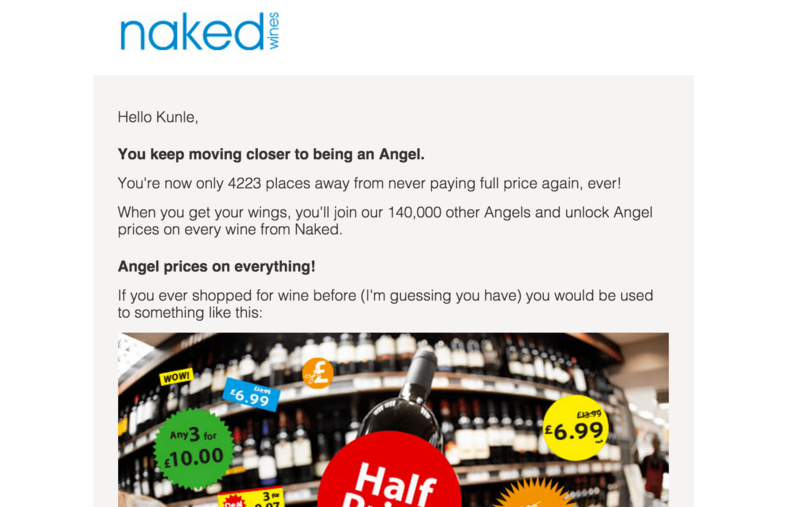 This is because Naked Wines nudges its members to purchase a 12-bottle case of wine at these events for a £15 discount (the value of their ticket, although worded as a ‘ticket money back’ offer in addition to their ‘Angel discount’). 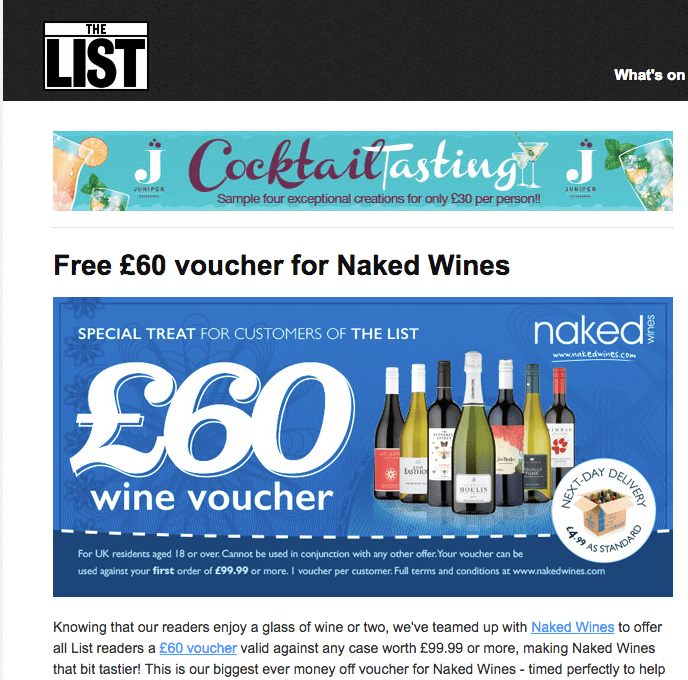 I also intend to write another blog post, dedicated to Naked Wines’ customer retention email marketing strategy, which will categorise the different types of emails I receive from Naked Wines. 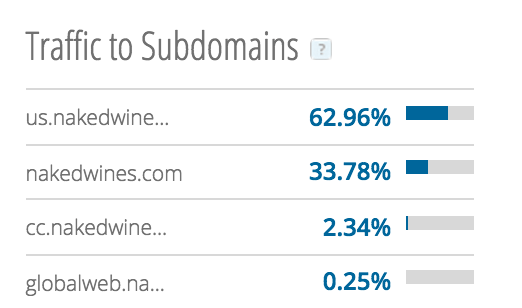 By now, you probably think that I drink way too much wine — having hung around the Naked Wines site for this long! 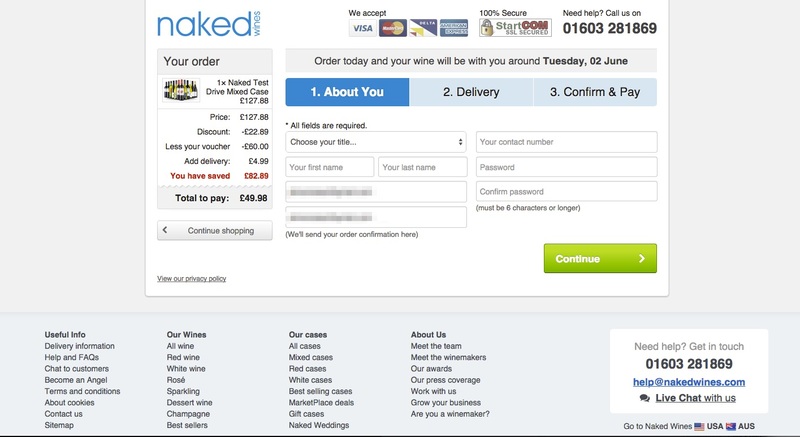 I’ll summarise by concluding that I think Naked Wines are one of the UK’s most sophisticated and innovative online retailers, from a consumer psychology, tone of voice and customer retention standpoint. 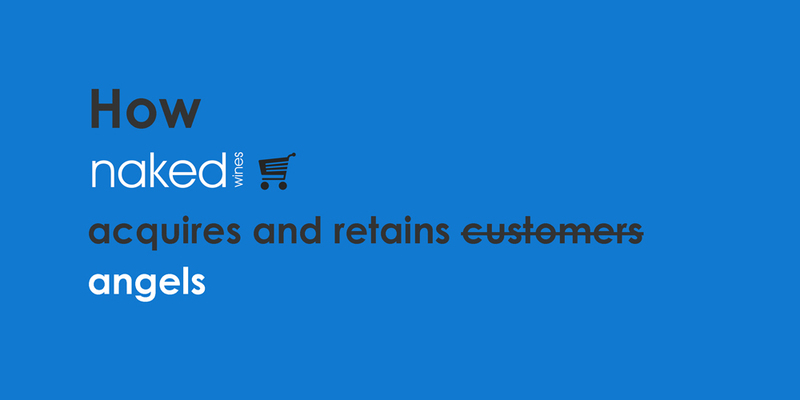 They make for a brilliant case study for any business looking to sharpen their retention efforts and also customer perception from a communications angle. Their customer acquisition is spearheaded by a voucher code distribution strategy through an extensive network of influential online and offline partners. 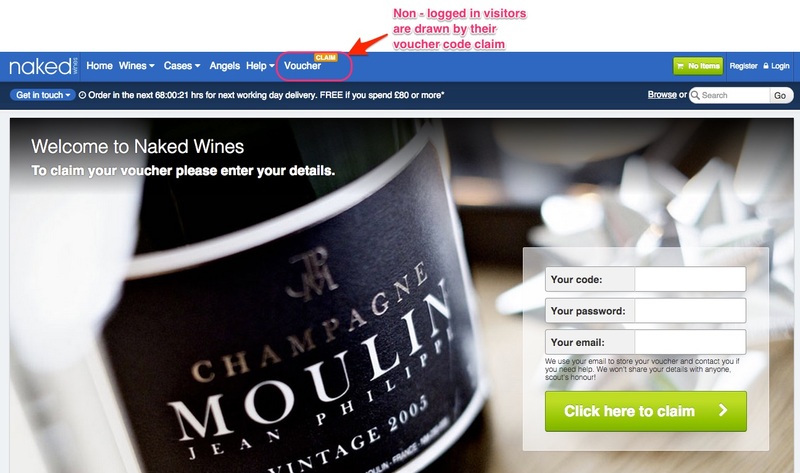 Their objective is to get as many people as possible to see, and hopefully use, the voucher. They are not big on SEO and PPC because, in their business, ‘Search’ has a limited reach. The habits of a significant number of shoppers do not involve searching online for where to buy wine; they simply shop at grocery stores, local wine shops or online wine stores with which they are already familiar. 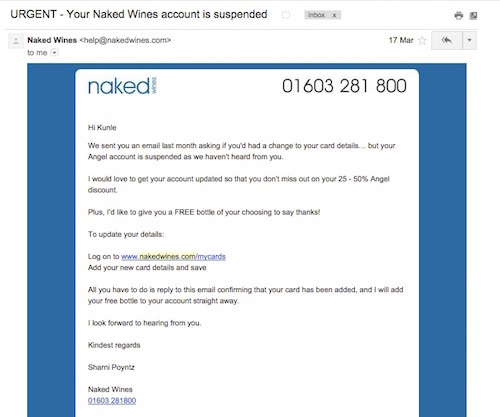 Naked wines has had to use its voucher code as a magnet to draw potential customers to its doors — and then, with its brilliant retention efforts, has managed to convince these leads to change their habits. The result is, as previously mentioned, that Naked Wines currently has more than 300,000 customers funding more than 130 winemakers. Their email marketing communications are, dare I say it, award worthy. 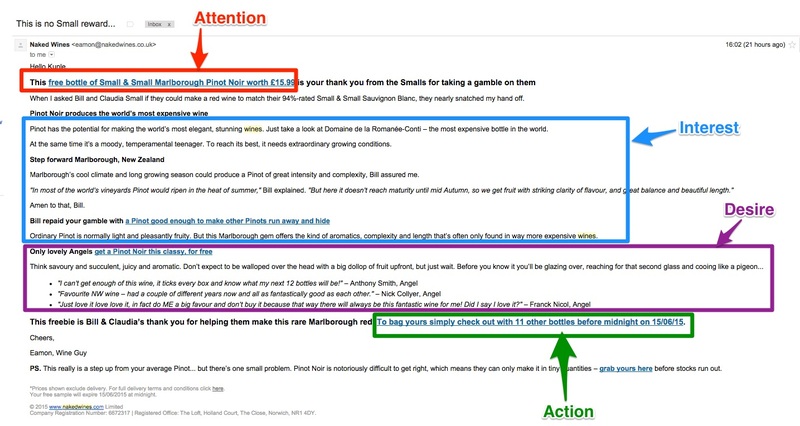 Their tone of voice is conversational and they do not overtly ‘advertise’ with flashy html banner emails — they simply use text emails, the likes of which could come from a friend and do not in any way come across as aggressively seeking a sale. Their community, again, is a huge winner — they offer you the access to speak with the maker of the bottle of wine you just drank. You can also speak to other wine aficionados. Their platform and business is truly worthy of academic study. So… what do you think about Naked Wines? I love how thorough this post is, Kunle. Fantastically done. I have a feeling this would do really well as a SlideShare deck, too.